The world’s favourite choice of collars and leashes for dogs are made from TPU. Printed with some pet friendly symbols, this is yet another classic addition in TPUs from the stable of Puppy Love. 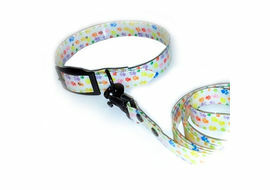 This printed collar and leash set are not only eye-catching with their neon finishing, but also make your pet an immediate centre of attraction. 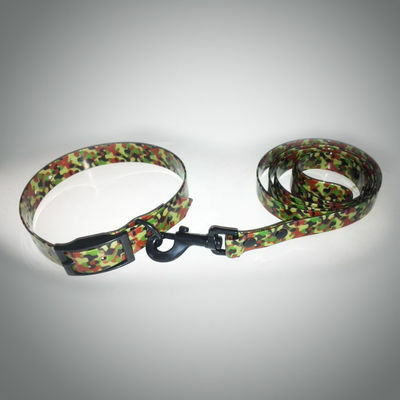 Walk him at the dog park and find how inquisitive his wagging mates get to see him on a printed TPU leash and collar. These TPU leashes from Puppy Love are basically nylon leashes which are covered with a fine layering of thermoplastic polyurethane thus making it the sturdiest collars and leashes in the whole world. The fine layer of TPU offers many useful properties like transperancy, resistance to oil grease & germs and above all abrasion. 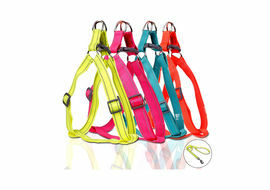 With attractive shades of neon, these leashes glow in the dark and well-lit ambiences. The world’s favourite choice of collars and leashes for dogs are made from TPU. Printed with some pet friendly symbols, this is yet another classic addition in TPUs from the stable of Puppy Love. This printed collar and leash set are not only eye-catching with their neon finishing, but also make your pet an immediate centre of attraction. 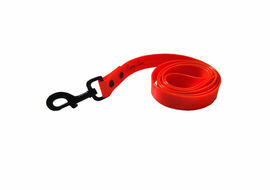 Walk him at the dog park and find how inquisitive his wagging mates get to see him on a printed TPU leash and collar. These TPU leashes from Puppy Love are basically nylon leashes which are covered with a fine layering of thermoplastic polyurethane thus making it the sturdiest collars and leashes in the whole world. The fine layer of TPU offers many useful properties like transperancy, resistance to oil grease & germs and above all abrasion. 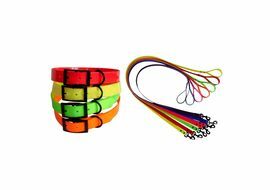 With attractive shades of neon, these leashes glow in the dark and well-lit ambiences.SpecsCOLLAR: Length fits well to 20-23 inches, Width – 2.5 cmsLEASH: Length – 125 cms, Width – 2.5 cmsAbout Puppy Love: Puppy Love is one of the most premium brands in the division of pet accessories in India. The company manufactures some of the most gorgeous looking leashes, collars, personalized name engraved collars, pet foot care materials ranging from anti skid shoes to water proof socks, blankets and other cute stuffs. All items of Puppy Love give a scintillating look to your pet – as if they are dressed up for a party. The designs of Puppy Love are exclusively designed and finessed by pet lover Nirja Puri.